Can an Alien Breed With Earth Animals? I have been creating an alien world for a while, and the sentient species on it is very canine-like. They have a canine body, legs, and head, and the only difference is that they have two prehensile tails (due to a beneficial mutation a million or so years ago) and short saber fangs that are always visible. I thought that because they look so much like dogs they can possibly breed with them. This probably won't happen very often, though, as they would possibly think of that as tainting their species, but it's still an interesting topic. Can an alien plausibly breed with a dog, even if they share no evolutionary relationship and are from different planets? Does your alien even use DNA? Is its biology even remotely similar to that of earth based life? If it is it would be a great surprise as both evolutionary trees will have been completely separate. Vague resemblance between species especially species from different worlds is no guide to their capacity to mate. Vampire bats and black birds share a number of similarities but there is no chance that they could interbreed. The biological differences between the alien dog and an earth dog would in all likelihood be greater than the difference between a dog and an oak tree. Those are pretty dog-like, don't you think? 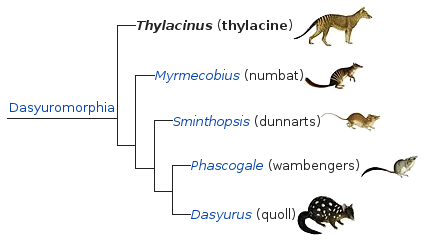 The order Dasyuromorphia (meaning "hairy tail") comprises most of the Australian carnivorous marsupials, including quolls, dunnarts, the numbat, the Tasmanian devil, and the thylacine. Wikipedia puts Dasyuromorphia as infraclass Marsupialia, of class Mammalia. Compare this to the gray wolf, which is of order Carnivora, in turn of class Mammalia. 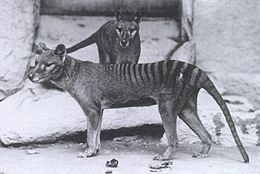 In fact, the photo near the top of this answer is not of anything even remotely related to a dog, but rather a pair of thylacine (also known as the Tasmanian wolf), photographed circa 1904 and now considered to be extinct. The odds that a thylacine would be able to successfully reproduce with a dog, despite their superficial similarities, appears rather slim, given how separated they are from an evolutionary point of view. But they have still both evolved on the same planet, and share e.g. much of their biochemistry. For example, both are carnivorous (even able to derive nutrition from much the same kinds of biomatter), DNA-based, carbon-based lifeforms adapted to survival in an oxygen/nitrogen atmosphere at about 1 bar pressure and with a surface gravitational acceleration just shy of 10 m/s2 and in a temperature range not that far from, say, 270 to 300 kelvin. Now consider what you are proposing: creatures which share no evolutionary history whatsoever. None, nada, zilch. As Slarty pointed out, do your alien creatures even use DNA? That's a kind of a one-in-a-billion buckshot that Earth life just happened to settle on because it turned out to work well enough for the first species that happened on it. DNA is a complex thing, and the odds of randomly stumbling upon exactly that are pretty low. (Evolution generally won't move away from a local maxima, even if the local maxima is low compared to a hypothetical global maxima. If seeking a higher maxima requires reducing fitness in the interim, that is exceptionally likely to be heavily selected against.) Is your alien adapted to survival in an atmosphere like Earth's? (Remember Earth's major extinction event known as the Great Oxygenation Event? That's when Earth's atmospheric oxygen content rose from about zero to peak as high as over 30% before falling back to the current level of about 21%. Yes, there was life on Earth before that, and in fact life was the cause of the great oxygenation event.) Do your alien creatures procreate by copulation between two individuals of opposite gender? Do they have two genders in the first place? (You can have sexual reproduction in situations with something other than two genders. Again, this is something complex Earth life settled on, but it doesn't have to happen that way.) And that's before you even get to the issues of, say, behavioral compatibility. You already won the exoplanet lotto. Might as well double down. The odds that your species would be able to breed with any Earth species seem infinitesimal. The odds that any resulting offspring would be fertile would, to the extent that this is possible, likely be much lower. See, crossbreeding between animals and aliens would be a hybridization, and we have a lot of barriers against hybridization. Reproduction itself is a process with a lot of controlling systems. Thus, your aliens would have to deal with all these controlling systems... They would need to have chromosomes similar enough to ours for chromosome pairing... or a system that could mislead and deceive this very important and central issue in reproduction, which is genetic compatibility. It's important to note that hybridization does occur in nature and is a very important phenomena in evolution dynamics, but a lot of conditions are to be satisfied for that, and a certain compatibility must exist. Take a moment to look into this very nice paper: Hybridization as an invasion of the genome. It has a section named Factors affecting the frequency of hybridization that will enlight you about some controlling mechanisms. If life was travelling trough space, in order to evolve here and in other planet in a way terrestrial and alien species would have the same DNA structure based life, both planets would have to have the same conditions for species to evolve under. Even if they did, the mechanisms that prevent two terrestrial species to crossbreed would certainly work for two species from different planets. But the advantage is, this is worldbuilding, right? Mallet, J. (2005). Hybridization as an invasion of the genome. Trends in ecology & evolution, 20(5), 229-237. Napier, W. M. "A mechanism for interstellar panspermia." Monthly Notices of the Royal Astronomical Society 348.1 (2004): 46-51. Burchell, Mark J. "Panspermia today." International Journal of Astrobiology 3.2 (2004): 73-80. Hoyle, Fred, and Chandra Wickramasinghe. "Comets-a vehicle for panspermia." Comets and the Origin of Life. Springer Netherlands, 1981. 227-239. Not unless you design the alien species to take sections of DNA from other organisms, and incorporate them into its own DNA. You could perhaps have a symbiotic virus that will take sections of animal DNA held in a special organ, and incorporate them experimentally into the animal's offspring's own genome, excreting a hormone if the transfer is unsuccessful or harmful, preventing other members of the same species from using the same DNA if it doesn't work. It may be that canine DNA is so useful, that the result is halfway between the sentient species and terrestrial dogs. The short answer is no. The long answer, however, is maybe, if all of the right conditions are met, and a truly unbelievable chance occurrence. A species is often defined as the largest group of organisms in which two >individuals can produce fertile offspring, typically by sexual reproduction. Considering that your canine-like creature comes from a different planet, they would likely be different species. There is, however, a miniscule chance where the reproductive organs on both sides are able to reproduce with each other, if some conditions are met, in order for them to be just close enough on the family tree to reproduce. This would still probably create something that is not fertile, but that is uncertain. The conditions would likely include: near Earth-like planet, near Earth-like natural history (including some dinosaur-like species that died out), near identical situations for the emerging species, etc., etc. With these requirements, it is nearly impossible through regular breeding. Genetic Modification In theory, genetically modifying your dogs reproductive organs could work, but the chances are extremely low, and they would likely require years of testing and trial and error. I don't know the kind of timeframe that you want this to be in, and it is hard to predict how long this would take. Regular Evolution It is possible, though unlikely, that these creature would find it beneficial to breed with dogs, and through some weird mutation gain the ability to do so, through evolution. Unless your creature had the evolution timeline of a squid(can't find a source for this, but squid's DNA is somewhat unstable, allowing it to change in one generation what other animals may do in ten), this would take a very long time, probably in the several thousand to ten thousand year range, if they're similar enough. Reproduction Via "Assimilation" This is the possibility that I find the most interesting: Reproduction via "assimilation." What I mean by this is, the creature that you're describing has found a way to reproduce with anything in it's entire family or order, due to the fact that it's sperm or egg is capable of using the genetic information of anything in your creature's family or order, and creating a hybrid offspring between the two creatures, but said offspring would lean heavily to the creature's side genetically, only displaying a few traits of the other animal. Such a trait would be very unlikely, but it would create an interesting world. If you really truly need your creature and dogs to reproduce, it is possible, but extremely unlikely, to the point, where no might simply be the more "correct" answer. The way we know it, breeding requires pairing base-to-base two sequences of DNA provided by the parent organisms. A minimal difference in the pairing (mismatching number of bases, wrong coding of genetic expression, etc.) results in no vital organism. If you take other animal species like lions and tigers, or horses and donkeys, cross-breeding is possible, but offspring are usually sickly (in the case of ligers) and/or sterile (in the case of mules, mostly). The ability to interbreed would hinge on the genetic similarity between the two species. If your dog-people were taken from earth by aliens and do have some genetic link to earth canines, the odds would be minuscule, as their genetics would be too different. If the dog-people evolved completely separately from earth species, the odds would be uncountably tiny (never say never, else I would say impossible). Also, in much the same way as the thought of a human a chimp together likely made you want to gag, that would likely be the response of a normal dog-person to getting it on with a dog. It could work if you make a universal biochemical translation device. Such a device could conceivably be made as some theories on abiogenesis suggest that a lot of the modern biochemical machinery involving DNA and RNA was actually reverse engineered from preexisting existing biochemistry. These are speculative ideas, but you can e.g. imagine running the processes inside the ribosome backward so that you start with proteins and get mRNA as output. That requires different enzymes than currently exist, but in principle chemical reactions are reversible. since the machinery of life as implemented by living organisms on Earth is in principle a universal constructor like a von Neumann machine, there should exist a representation of alien lifeform in terms of our own biochemical machinery. Can an alien plausibly breed with a dog, even if they share no evolutionary relationship and are from different planets? Short answer: no. Long answer: still no. Individuals from different species can't interbreed, regardless whether they evolved on the same planet or not. Sometimes convergent evolution produces animals that look, and possibly behave, very similar, but have very different DNA. The two species have evolved to fit the environment well, despite their different origins. This actually happens quite a lot. E.g. Red pandas (Ailurus fulgens) and Giant pandas (Ailuropoda melanoleuca) are thought to be not at all closely related. Koalas (Phascolarctos cinereus) look a bit like bears (Ursidae) but are in fact hugely different. Koalas are marsupials: their babies (joeys) are born with little development and do the bulk of their growth in their mothers' pouches. Bears are placentals: their offspring spend much longer in the womb and are almost completely developed (don't read this as mature) when they're born. Marsupials look like jelly beans when their born. Placentals (usually) look like miniature versions of the adults when they're born. The two strategies are incompatible. The external appearance has no bearing on the issue. Animals within the same species will have very similar DNA (compared with individuals from other species), and it's this similarity that causes a species to physically appear self-consistent. A Unix/Linux computer and a Windows computer might look identical while switched off, however, neither can run the other's software without emulators because their internals are too different from each other. The operating system is like their DNA, but despite their huge differences, and possibly sharing a small amount of code, they can do the same tasks as each other, at different efficiencies. Before Macs were Unix based, both their hardware and operating systems were vastly different from Unix based and Windows machines, yet they were also capable of performing the same tasks as the other computers on the market. Statistically speaking, the chance is greater than zero, however, it's so close to zero that it might as well be zero. I don't know how many universes you'd need for two species to evolve independently on different planets and end up with DNA close enough to interbreed. Probably billions. Think about the chance of someone completely unrelated to you who somehow ends up with exactly the same DNA as you, and in this case we're talking about two individuals within the same species! In terms of story-telling, your audience with a scientific background simply won't believe it. This is one of the issues I have with Star Trek: almost all aliens can interbreed. This is supposedly explained by having a "seeder" species that sowed DNA on all planets capable of evolving sentient life. The problem with this, is that such a long time passes before sentient life evolves that speciation occurs several times, preventing any possibility of interbreeding. If you want to keep your scientific audience, don't do it! There is a remarkably slight chance of this. Crossbreeds between reasonably close species have happened many times on this planet; inclusive of the beefalo, the liger, the sheep-goat, the yakalo, the cama, and any number of game bird hybrids. However, you'll note that the majority of these instances have been between creatures who have some common genetic ancestry, however distant. The trick is that you're speaking of a creature which has some phenotypical similarity to an Earth creature; but no common ancestry. A DNA-based species is actually quite likely, as it is the result of basic autocatalytic RNA which is the first thing looked for by xenobiologists (and yes, that is an actual field). However, we would be expectant of at least three traits; that is, it would be a bigendered species (male and female), the mechanics of mating would be reasonably similar, and the combination of genes would provide some form of functioning organism and not "noise code". That isn't as far afield as you might think, as DNA is effectively a fractal program for the structure of an organism and horizontal gene transfer between species happens all the time. So, if essential to your story, I must emphasize that conception with an exoplanetary species is very unlikely; but yes, it is possible. That said, note that in the vast majority of real-life and Earth-bound cases (such as the liger) the offspring is completely sterile, and your case is likely to develop any number of congenital genetic disorders as it gets older. You need to remember that natural selection played no part in this hand; which makes it that much more volatile and unpredictable. Probably not, the key phrase is "share no evolutionary relationship" so they're in no way related to dogs, they can't therefore breed in the usual manner with earthly canines. So that's that no breeding for you right? Consider creatures like pseudodomonas aeruginosa which has genes that appear to allow it to speed up its own rate of genetic mutation to take advantage of new environmental niches. If you take this and also the ability of terrestrial viruses to play "cut and paste" with genetic material then something with a very strange, from our point of view, heritage might indeed "breed" with terrestrial species as in mate with and create offspring that have a hybrid genetic heritage. The Alien franchise suggests something like this with the Xenomorph, a creature with a basic template form that can hybridise with its gestational host. Since your species evolved on different planets from different ancestors, most likely different ancestors all the way down, your chances for any two species are so close to zero it's hardly worth mentionning the differece. But wait... this is an infinite universe (for all we know). It has a very, very, very large number of planets in it (it should be an infinite number). In your version of the universe, there are at least two planets where life evolved. That means the actual number of planets hosting life must be very huge, next to infinite. On our planet, life, based on DNA, evolved, that means this is one possible route how life can be formed. On some of our infinite planets hosting life, it is fairly safe to assume that a similar route was followed (based on the fact that this route is possible, otherwise you wouldn't be reading these sentences right now). Now, we started with the assumption that chances are infinitesimally small (almost, that is). But we also have an infinite number of coin-tosses. The chances that you find two species in an infinite universe that can interbreed although they have no common ancestor are almost exactly 1. Finding those two species is a completely different matter, but then again, you're writing a story, so the match was made. And lots of unwritten and boring stories cover the cases that didn't match. Your alien dogs could have evolved naturally on you alien planet. Panspermia is proven true and both worlds share DNA as their building blocks. Your aliens are smarter than us and engineer a breed of their dogs such that its DNA is just capable enough of combining with an Earth Dog's. They inject their DNA into their host via retro-viral like transference. Such that one of these hits the egg and correctly inserts its genes into a non-destructive part of the human DNA. The genetic variability in these retro-viruses is so wild that the chance for impregnation has a small random chance. coincidentally this could also explain the physiological changes in a woman needed to support such a pregnancy as her own DNA would be changed. Bare in mind the chances of this working would not be 0 but very close. Likely there would be a lot of deaths as well. Yes, alien should breed with dog, but is not for tommorow. Alien can pass out the "challenge" of no evolutionary relationship sharing by transgenesis. This transgenesis can be provoked with irradiation, proximity with a chemical mutagenic agent solution or a bacteria like the "Agrobacterium tumefaciens". Not the answer you're looking for? Browse other questions tagged aliens xenobiology genetics or ask your own question. Would humans be able to derive nutrition from foodstuffs found on alien planets? How would a child of a human and alien inherit abilities? When traveling to an alternate Earth, how many generations would you have to breed with the natives to prevent inbreeding? Could a planet's ecosystem function to serve the balance of all, rather than survival of each one? Realistic alternatives to oxygen-based respiration?